This chopped Greek Salad and Herby Roast Chicken is full of the flavours of summer. Read on to find out how to make this quick and easy meal. I like to think that although the recipes I share are interesting and delicious, that they are also easy enough for anyone to cook. (Feel free to jump in and correct me if I’m wrong…) It’s no secret that I am not professionally trained, I’m just someone who loves good food and likes to share what she creates. This dinner is no exception. It’s a simple, healthy dinner that I could make with my eyes closed. Are you liking the sound of it yet? The first time I did a variation of this dish, I had invited myself over to my parents for the weekend. I was actually visiting friends and needed a place to stay. They were incredibly busy so to repay the favour I offered to make them Sunday lunch. I didn’t want to take over their kitchen and make a mess so I threw together a simple chopped salad and served it up with a ready roasted chicken I bought from the hot counter at the local supermarket. (Shock horror, food blogger admits to not roasting her own chicken…there’s no shame in using these chicken’s they are delicious!) The lunch went down so well I filed it to one side as a quick and easy meal that I could throw together last minute for unexpected guests. This week, my parents stopped by my flat after visiting my Grandma in hospital. She has dementia and while my parents were away she was admitted to a hospital nearly 2 hours away from where we all live. It’s been an incredibly stressful time so when they mentioned they’d be driving past us on the way back from the hospital I knew I should invite them in for a bite to eat. The last thing they needed to be worrying about on a Sunday evening was where there next meal was going to come from. This time I roasted the chicken myself (hurrah!). There’s no rocket science behind it, all you will need is a lemon for stuffing the bird and a few fresh herbs to season. Of course if you want to make this dinner in the week you can buy one of the ready cooked chickens from the hot counter like I mentioned earlier, or simply serve the salad with leftover cold cuts from your Sunday roast. This is such a laid back, lazy dish that it doesn’t matter where the chicken comes from or whether it’s served hot or cold. Just do whatever is easiest for you. When Mum and Dad stepped in to the flat and smelled the chicken cooking you could see the tension ease from their shoulders. Big smiles all round! 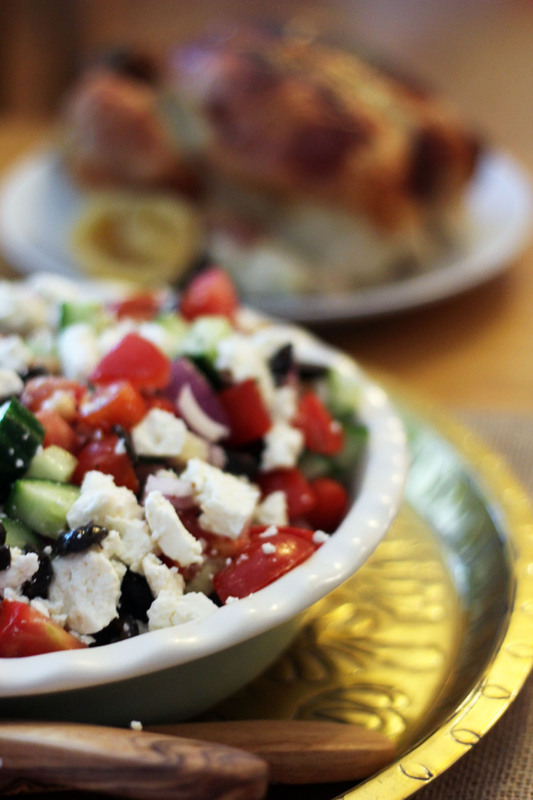 The Greek salad also went down incredibly well. My parents have been holidaying in Corfu for years and it reminded us all of summer holidays. Just like the chicken, the salad is easy to make too. It’s a chopped salad so no skill required here. I’ve simply taken cucumber, tomato, red onion and feta as my salad base and added on some black olives and chickpeas to bulk out the salad a little further. 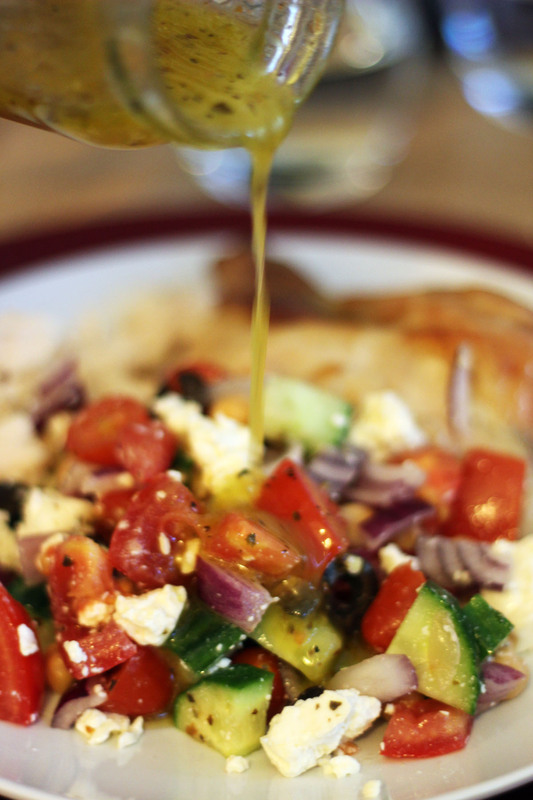 The Greek vinaigrette is made with lemon, oil, garlic and oregano which really takes this from a simple fresh salad to one that really packs a punch! It can also be drizzled over the chicken for an extra hit of flavour. Begin by pre-heating your oven to gas mark 1 of 140C. Next rub the chicken with the butter and sprinkling the herbs over the top. Cut the lemon in half and place inside the chicken. Pop the chicken into a baking tray, pouring a cup of water in the bottom of the pan and cover with foil (avoid the foil touching the chicken). Bake in the centre of the oven for 1 hour. Remove the foil cover from the chicken and turn the oven up to gas mark 6 or 180C. Bake for another 20 minutes. 15 minutes before serving combined the salad vegetables in a large dish. 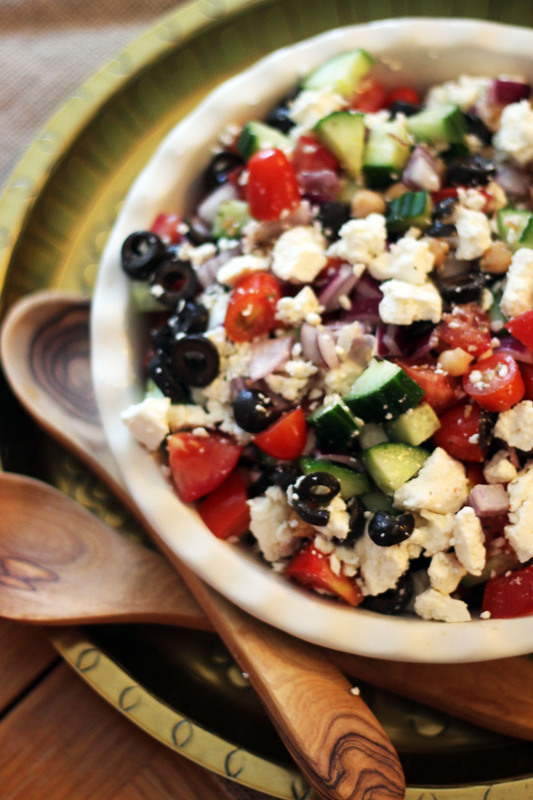 Crumble the feta over the top and toss together. Finally, mix the oil, vinegar, lemon juice, garlic, herbs and seasoning. Place this in a jug or jam jar for serving. Serve the chicken on a large plate with the salad and vinaigrette so people can help themselves! A top tip for ensuring the chicken is cooked is to pierce the thigh of the chicken with a skewer, only once the juices run clear is the chicken cooked through. The key to getting a succulent chicken is not to over cook it. 40 minutes per kilogram plus an extra 20 minutes, uncovered is all you need for a moist chicken with crispy, golden skin. As you’ll see from the recipe, I also add a lemon, halved, into the cavity of the chicken which infuses the chicken with lemon. Squeeze the cooked lemon over the top of the bird before serving for extra zing! It gets all jam like and sweet so its not too overpowering. For a lot of people in the UK the smell of roast chicken reminds people of home. It was lovely to see my parents smiling over dinner after the difficult week they’ve had and I’m glad my food could help to achieve that! Oh yum!! This is just my kind of meal – gorgeous colours and flavours! mmmm! Thanks Kevin! I might try swapping out the chickpeas for new potatoes next time. Great suggestion! Mmmm, you really cannot beat the smell of a roasting chicken, and this salad looks like a total winner.